Quality refers to the excellence of the product. At MCR, we make sure that quality control is enforced synthetically and regularly at every stage of the production life-cycle from the testing and purchase of raw materials through to dyeing, weaving, finish, printing, packaging, to after sales service. In all our undertakings quality remains our top priority. We have a separate quality control department consisting of several qualified people that are dedicated to performing the necessary checks are each level. Our prompt and earnest efforts to always deliver the highest quality products ensure that our customers only get the best from us. Our contacts in the industry are built over generations and our suppliers and vendors are part of our extended family and follow the same levels of stringent testing as we do. Being committed to strict Quality Management measures in every single activity proves how passionate we are in upholding our brand values and brand image that we have worked so hard to build. Quality is not merely an option we provide to the customer. Rather, it is a way of life and it pervades our every action. We have also taken great care to address safety in the work place from any and every occupational hazard. As a result of effective management of the above we have gained the ISO and OHSAS Certifications. 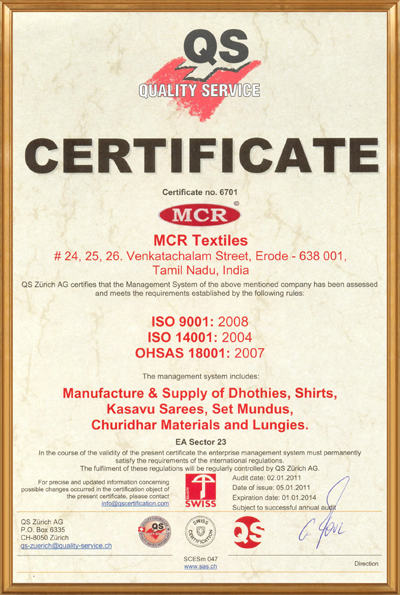 We are also the first Dhoti company in India to be certified ISO 9001:2008, 14001:2004 and 18001:2007 for quality management, environment management and occupational hazard safety system management respectively.